At this time of year, the time of year for making resolutions about being more healthy, having a good breakfast is a good thing to do. Bircher muesli differs from other muesli because it is soaked in a liquid overnight. Some people soak their bircher in cream which gives the most rich and wonderful result ; but not quite what we are looking for here. We soak our bircher in water. 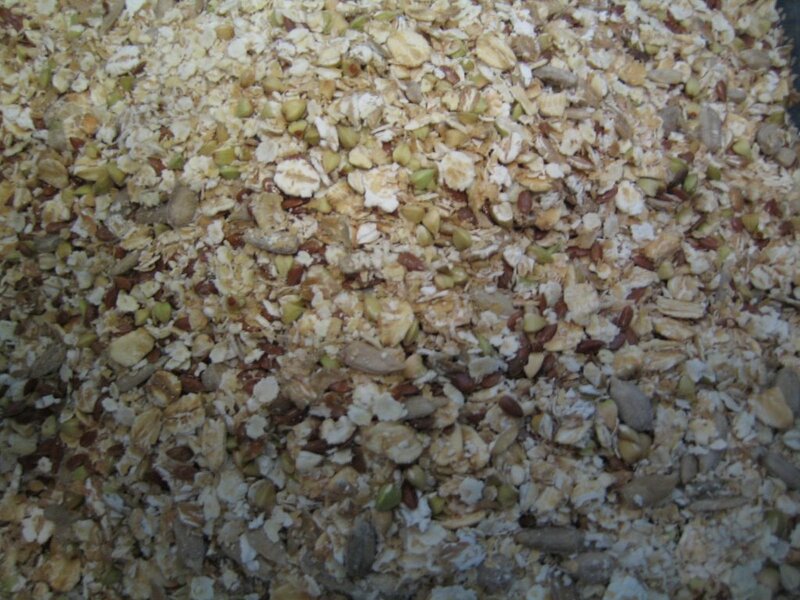 The overnight soaking softens the seeds and grains making them more digestible and the nutrients with more accessible. The possible ingredients for bircher muesli are almost infinite. I have a basic blend to which I add any suitable items I have on hand. But the muesli is only the beginning! It is the complete dish which is most amazing. We add raisins to the soaking mixture and yoghurt and fruit before eating. Fibre, trace elements, protein, essential fatty acids, vitamins are only a few of the good things to be gained from a bowl of bircher muesli. And it is cheap. I buy the amount of each ingredient I need from the bulk bins at the local organic shop. 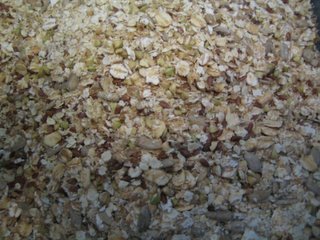 I often add rye flakes, millet flakes, oat bran, wheat bran, sesame seeds, pumpkin seeds. To prepare - soak a measure of the dry mixture in an equal volume of water overnight, add raisins or other dried fruits as you like. To serve - add some yoghurt, raw or stewed fruit and some nuts if you fancy them. A brilliant breakfast, quick to prepare, you can even put everything in the night before. Easy to transport in a container with a tight fitting lid if you need to rush off to work and have breakfast there . . . I'm so pleased you posted this one as I need to lose a lot of weight but enough about that! I'm in need of some new year resolutions and this is something I figure can keep to. I guess the trick is not to eat too much! Bruce - the trick is to enjoy everything in moderation!! I say that with irony because you know me and I know you!